The United States, Britain and France jointly launched missile strikes into Syria early Saturday, targeting facilities used for designing, manufacturing and storing chemical weapons in retaliation for Syria’s alleged use of those weapons one week earlier. But the attack ordered by President Donald Trump and his French and British counterparts drew a mild response from the regime of Syrian President Bashar al Assad. Defense Secretary James Mattis said the “decisive action” by the U.S. and its allies was directed at Syria’s chemical weapons infrastructure and was meant to deliver a message that didn’t get delivered a year ago when the Syrian government used chemical weapons in the town of Khan Sheikhoun. It’s just a year ago that the U.S. fired 59 cruise missiles at the air base that was used to launch aircraft bearing chemical weapons. This time, the message was that “Assad, and his murderous lieutenants… should not perpetrate another chemical weapons attack for which they will be held accountable,” Mattis said. Mattis noted that the strikes were directed at the Syrian regime and said the U.S. and its allies went to “great lengths” to avoid civilian and foreign casualties – a reference to Russia’s sizable air force and military advisory presence. The Assad regime appeared to take the attack in its stride. The official SANA news agency said Syria was facing U.S., French and British “aggression with the same strength” that it had faced “terrorists,” the label that President Bashar al Assad has applied to moderate political opposition who began a nationwide uprising against him in March 2011. But Trump was clearly limited in his freedom of action by the views of British and French allies as well as Mattis’s reported warnings that a more wide-ranging strike could escalate into a war with Russia, which has become Assad’s prime outside protector. U.S. officials said that more attacks could follow. “What you’ve seen tonight is not the end of the U.S. response,” a senior official said. He said military planners “have built a lot of flexibility into the plan to allow for further strikes, based on what they’ve hit tonight.” A lot will depend on Russia’s response in the next 24 hours, officials said. Part of the challenge the administration faced was that earlier in the week, even as Trump made repeated threats of retaliation, Russia and the Assad regime took steps on the ground to weaken the impact of a limited U.S. intervention. The Syrian army reportedly moved its most advanced warplanes to Russia’s Khmeimim airbase near Latakia, in apparent hopes that the U.S. will not attack any target on a Russian base. According to Turkey’s state news agency, Iran-backed militias evacuated military sites in Qalamun northeast of Damascus towards the Lebanese border. The Anadolu agency some of the equipment at the Dumeir and Al-Sin bases had been taken to the civilian airport in Damascus, but missile ramps and ammunition had been relocated outside civilian bases. 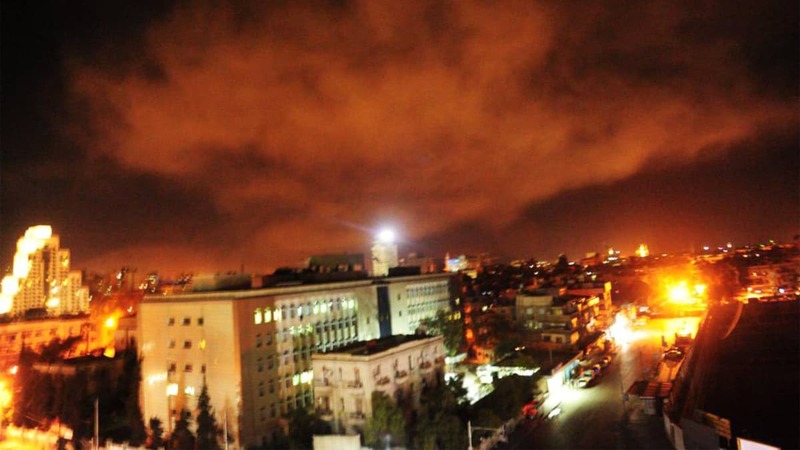 Assad also has installed advanced air defense weapons and deployed military forces into the capital of Damascus, in effect using its residence as a human shield against U.S. airstrikes, opposition media reported. In an even more extraordinary move, sources within Assad’s military also said that Syrian warplanes had been moved to bases in Iran. The claims that could not be confirmed. The attack on Douma, which Russian news media reported Thursday was now entirely in regime hands, marked a major advance for the regime. One of the first areas to join the “Arab Spring” uprising against the Assad regime in 2011, Douma had long been under starvation siege by the regime and was the last major rebel stronghold in the Damascus suburbs. The size of the rebel force there was estimated at up to 20,000, and with its proximity to Damascus, it would have been able to move into the capital quickly if the regime was on the brink of collapse. Between last Friday and Monday, the city with 140,000 inhabitants underwent a fierce barrage directed at the civilian population. According to the White Helmets rescue organization, there were 291 Russian and regime airstrikes, 153 barrel bombs dropped from helicopters and 800 artillery shells as well as three barrel bombs filled with toxic gases. Douma forces subsequently surrendered, and Russian forces were the first to enter the city Thursday, followed by regime forces. Russian officials said the checked the location of the alleged chemical attack and pronounced it was a fake report. Now the Assad regime is busing the population to northern Syria, a repetition of a series of expulsions going back to September, 2016, when the city of Moadamiyeh fell to a combination of starvation siege, airstrikes and artillery. The seventh group of Douma expellees arrived in northern Aleppo Friday, 100 buses carrying rebel fighters with their small arms and family members. There are thousands more waiting to be moved after the Islamic weekend, which starts Friday, is over. Syrian opposition news media said as many as 200 more buses waiting at the scene.